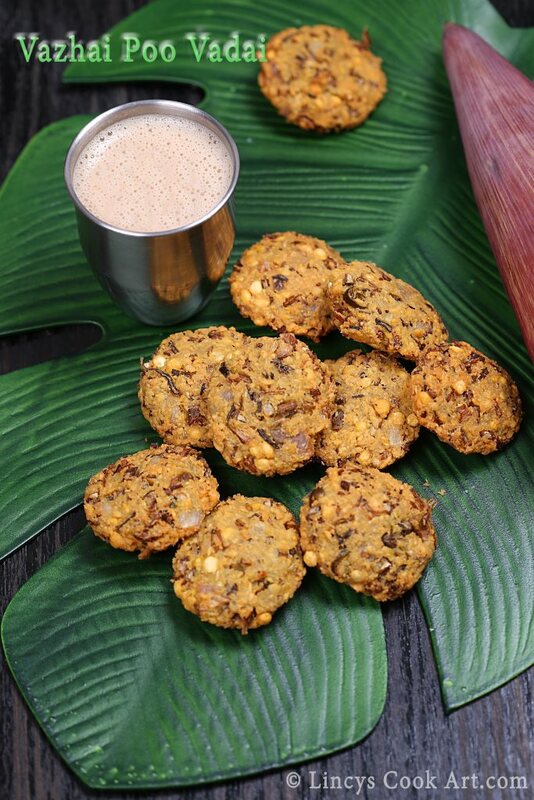 Vazhai Poo Vadai | Banana Blossom Fritters is a healthy & tasty evening snack. I did taste these fritters for the first time during school days and it was just awesome. Vazhai poo has a lot of medicinal properties. Banana flowers are rich vitamins like C and E, flavonoids , protein, minerals like potassium,calcium,iron,copper, phosphorous,magnesium and dietary fiber. It is free from sodium.This flower has been used as a traditional medicine to treat bronchitis ,constipation, menstrual cramps and ulcer problems. It boosts mood and reduces the anxiety because the banana flowers have high levels of magnesium. It regulates the blood pressure. The study results of the journal phyto theraphy research shows ,the oral intake of banana flower extract for 30 days may significantly reduce the blood sugar levels in diabetic patients and increase the hemoglobin levels . Clean the banana flower by removing the centre stiff stick(pistil) and the scale. Chop the flower and soak inside water to prevent browing process if you are not preparing immediately. Meanwhile chop onion, green chillies, ginger and curry leaves. Drain the water totally and transfer that on a blender jar; add the fennel seeds and jeera. Now add onion, green chillies, ginger, curry leaves, asafetida and salt. Add the chopped banana blossom and mix well. Note:You could use half a cup of chana dal and half a cup of toor dal if you prefer. Delicious and healthy vadai.. Nice clicks! !